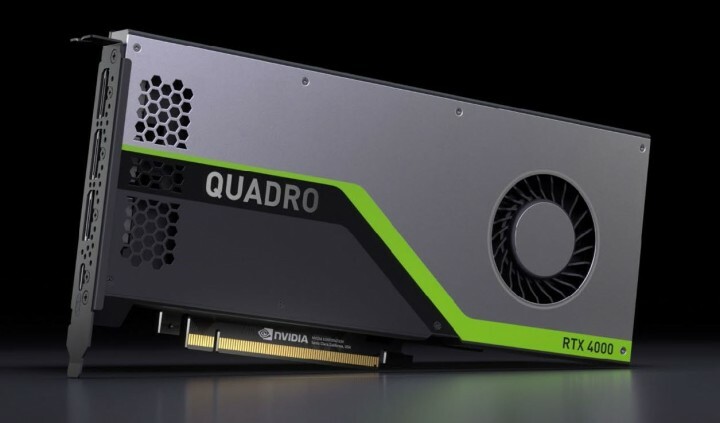 At the introduction of its paradigm-shifting Turing generation GPU, Nvidia released three initial versions of Quadro RTX products, the RTX 8000, RTX 6000 and RTX 5000. All are expensive, pricy enough to fit into JPR’s Ultra-high End professional/workstation GPU class, defined as anything over $1,500 street price (and in fact, the RTX 5000 sells at around $2,500 with the 6000 and 8000 up from there). Yes, all those SKUs will sell—and you might be surprised how many—but they serve more as technology-proving marketing showcases for Turing’s potential, especially in the realm of ray tracing and AI acceleration (much more on those features ahead). We’ve been waiting for the most accessible tier, the Quadro 4000-class series typically selling under $1,000—to be refreshed with Turing to get a feel for what Turing can do for a far more significant chunk of the workstation. That time is now, as Nvidia has brought the Quadro RTX 4000 to market. Paired with 8 GB of new GDDR6 memory (same footprint as the P4000), the single-slot RTX 4000 sells for about what the P4000 did at introduction (a sampling of online retailers reveals a street price today right around $1,075). Notably, at 160 watts max, the RTX 4000 consumes considerably more power than the 105 W P4000, though it stays within a single-slot width package. As is our norm for evaluating workstation-class graphics cards, we ran SPEC's Viewperf, in this case, both the newest version 13 along with the previous version 12. Viewperf focuses workload on the graphics card, such that the rest of the system isn't (or at least shouldn't often be) the bottleneck. As a result, Viewperf will give a good idea of which card has the highest peak performance. However, it's worth noting that the magnitude of any superior numbers does not indicate the level of superiority it will have in a real-world environment where the rest of the system, OS, and application may impose other bottlenecks. Using the more up-to-date Viewperf 13, the RTX 4000 managed to outperform AMD’s Radeon Pro WX 8200, with respect to raw scores, price–performance and performance/watt. The RTX 4000 posted 48% higher scores on average, while the WX 8200’s currently lower price point reduced the RTX 4000’s edge to around 38% on scores/dollar. 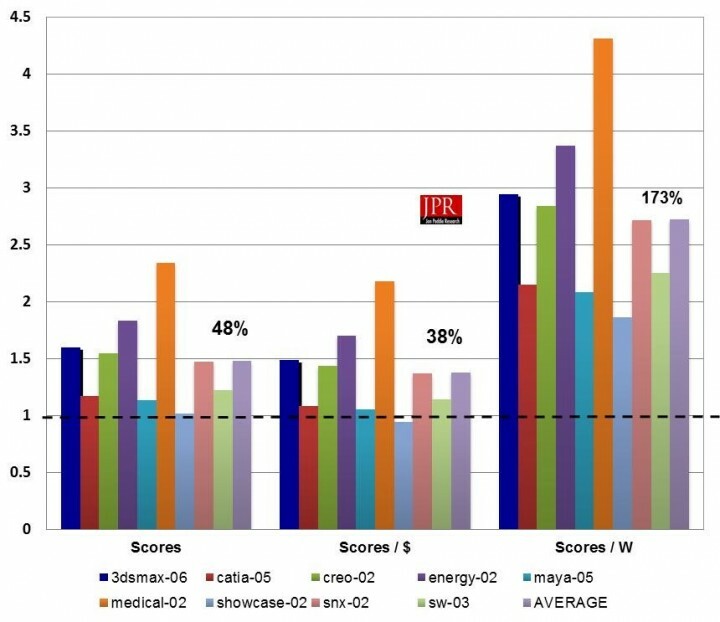 Finally, the WX 8200’s notably high 230-watt rating pushed the RTX 4000’s advantage in scores/watt up to 173%. The RTX 4000 also has the advantage in form factor, maintaining the P4000’s single-slot thickness, compared to the WX 8200’s dual-slot width. Viewperf is a fine benchmark. In fact, for past and current visual workloads in popular workstation applications, there isn’t a better tool for making comparisons. But again, with Turing, we’re no longer talking about hardware that’s outfitted just to accelerate traditional 3D graphics. With Turing, with the addition of Tensor Cores and RT Cores, Nvidia invested significant cost in functionality well beyond traditional 3D raster graphics, accelerating machine learning and ray tracing. In reality, even the machine learning hardware helps accelerate ray tracing through a deep neural network that de-noises the raytraced image while rays are still being fired, essentially taking a short cut to the final image. So the Tensor Cores are assisting the RT Cores in the aim of delivering on Nvidia’s claim of real-time ray tracing. 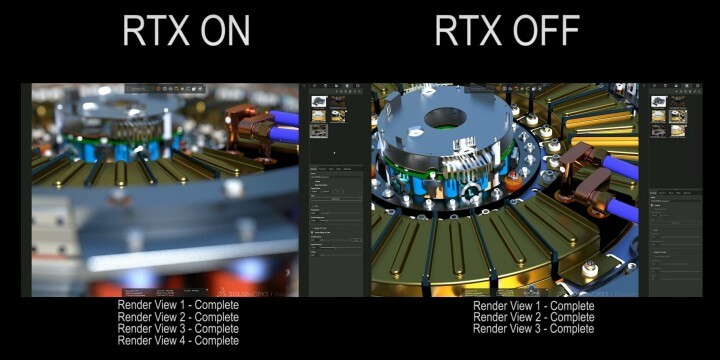 As such, whether you as a buyer have ray tracing performance as a key criterion or not, it’s worth considering what the RTX 4000 can achieve in the non-traditional areas Nvidia chose to focus on: ray tracing and machine learning. Let’s look at ray tracing first, as Nvidia looks to exploit not only the existing array of CUDA cores (as it has for its iRay renderer for several generations), but both the new RT Cores (for firing rays) and the Tensor Cores (for machine learning but directly contributing to ray tracing performance via de-noising). Remember, the RTX versus non-RTX gain is in addition to whatever speed up Turing can manage over Pascal without the help of RT and Tensor cores. Given the speed-up we saw for Viewperf (30%, which does not make use of those cores), then combining and extrapolating, it’s reasonable to expect the RTX 4000 to render about 70% faster (plus or minus of course, depending on specific scene) with RTX on over its predecessor, the P4000. Interestingly, that 70% is in the ballpark of what Nvidia also claims as the RTX 4000’s speedup over the P4000 on the rendering benchmark Luxmark 3.1. Based on the Nvidia-supplied chart, that speedup was in the 50–80% range, depending on the scene. 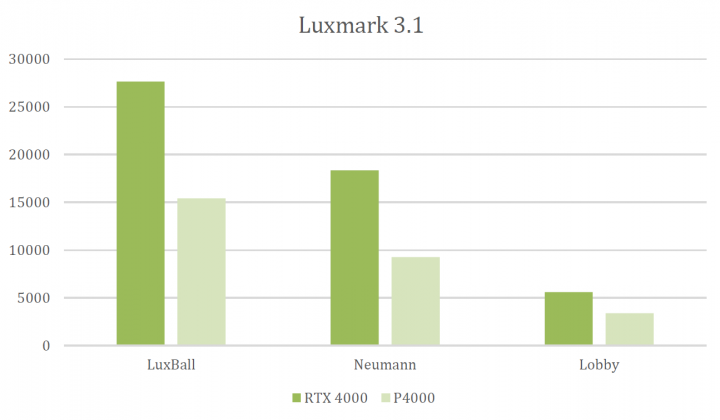 We didn’t run Luxmark, but based on our extrapolations, Nvidia’s figures would appear a credible speedup for the RTX 4000 over the P4000 on raytrace workloads, on average. While the Tensor Cores help speed ray tracing through the use of a deep neural network (DNN) trained to de-noise a scene in mid-render, Nvidia research teams are finding and developing other uses for both machine learning and Tensor Core acceleration that dovetail nicely into professional visual workflows. Dubbed NGX, the company has formalized NGX, an enhanced set of DNN-driven image-enhancement features. I imagine Nvidia sees NGX today as anything but a fixed set of features, but rather an evolving and expanding toolbox of DNNs that can further harness machine learning for the benefit of Nvidia’s traditional visual markets. For Turing’s official launch, however, Nvidia’s pitching four specific NGX features, which will eventually be exposed to applications in the NGX API: Deep Learning Super-Sampling (DLSS), AI InPainting, AI Super Rez and AI Slow-Mo. DLSS is immediately valuable as a way to reduce the overhead of supersampled anti-aliasing by intelligently selecting fewer sample points, as opposed to more points of a conventional regular distribution. NGX’s other three advertised AI-enabled tools are geared more to quality enhancements for existing images and video, rather than those being created in real-time via the GPU’s graphics pipeline. AI InPainting uses Turing’s inferencing capabilities on a DNN (pre-trained from “a large set of real-world images” to essentially understand what’s missing (e.g., corrupted or intentionally deleted) in an image and fill in those areas with detail appropriate for the content. AI Super Rez is similar to InPainting in the sense that a trained DNN is recognizing image content and filling in what isn’t there. Super Rez is employed during image scaling, which even with esoteric filters applied is subject to artifacts of aliasing, resulting in visual blocks or blurs. By contrast, Super Rez creates credible image data based on the content detected resulting in a more eye-pleasing result at virtually any scale factor. Finally, and also similarly, AI Slow-Mo creates intermediate video frames utilizing a DNN to intelligently interpolate video frames to create intermediate frames that didn’t otherwise exist, fitting both content and temporal behavior. But if you expected a card that delivers a meaningful bump in performance on existing visual workloads and provides a bridge to future workloads, then I’d say it’s succeeded. No, it doesn’t deliver dramatic gains on legacy usage over its predecessor. But it does fare very well compared to its primary market competition in terms of performance, power and form factor. 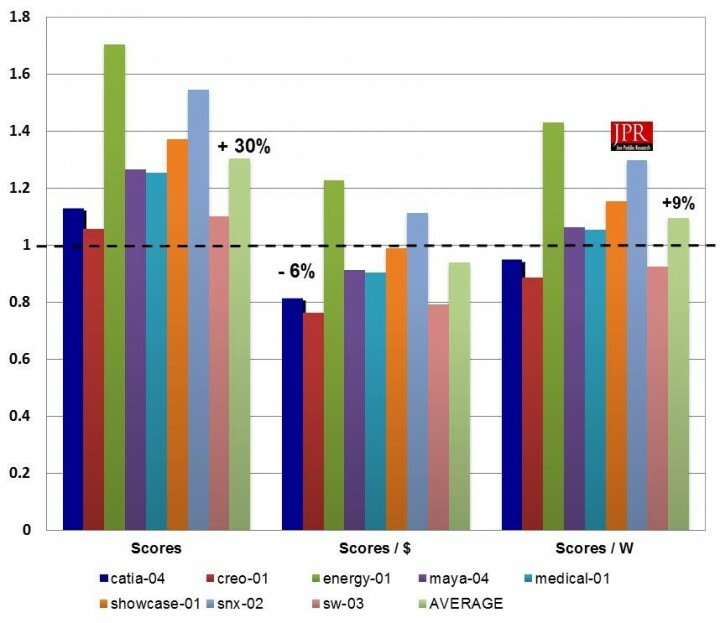 And it would appear (both by benchmark data and logical extrapolation) that its speed up for ray tracing is far more significant. As such, it’s helping pave a path to a more ubiquitous ray tracing future, which I’d argue is more valuable to Nvidia long term, even if it means disappointing some today looking to run legacy visual workloads exclusively. In Fermi, Nvidia left some expensive functionality in its graphics-first chip/product SKUs—notably fast double-precision floating point and ECC memory—that helped the new applications it wanted to serve but did nothing for its bread-and-butter markets. As a result, Fermi’s performance/watt and performance/dollar suffered a bit in those markets. In exchange for that bit of suffering—which was not pronounced and proved short term—Nvidia achieved what it wanted to: establishing a foothold in HPC applications and data centers which has since blossomed into a $3 billion-plus dollar business with its Tesla brand GPUs. Will the demand for real-time ray tracing emerge in dramatic fashion—and therefore justify the choices Nvidia made with Turing—the way non-graphics compute applications did? There’s no guarantee, but I’d argue that long-term, pursuing ray tracing with Turing is a safer bet than pursuing HPC with Fermi and subsequent generations. I’d further make the case that eventually, all 3D visual processing which has photorealism as a goal will be ray traced. While the industry has cleverly and consistently improved upon the 3D raster model, it’s ultimately still a hack when it comes to global illumination … and ray tracing will always do better where photorealism is the goal. Until more momentum develops, however, Nvidia will have to weather some criticism just as it did with the transition to Fermi. With Fermi, much of that criticism centered around power consumption and thermals. In the case of the Turing Quadros (and GeForces for that matter), the criticism is that they don’t deliver quite the inter-generational punch they should for conventional 3D graphics. 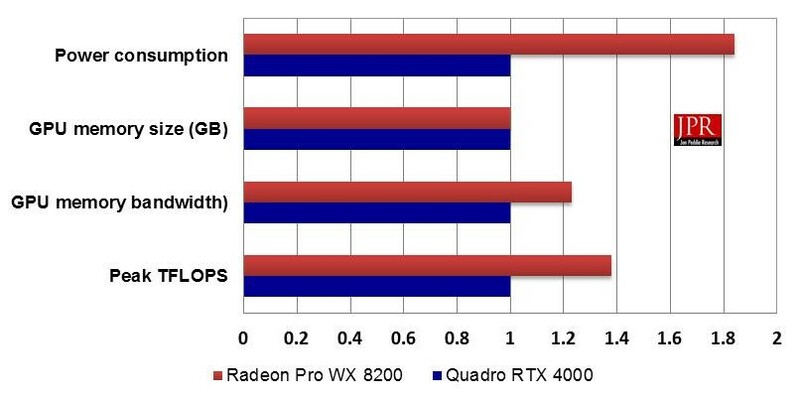 There’s some truth to that, and certainly, the 4000 RTX can’t match the jump on Viewperf that the P4000 managed before it. Still, the 4000 RTX should do fine, even when measured in conventional terms. It represents a capable if not stellar upgrade in “legacy” usage models, and more importantly, it can argue superiority over its primary market competition.